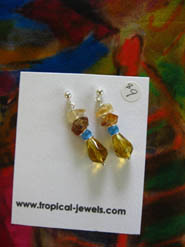 Tropical Jewels Use Sterling Silver And Glass Beads. 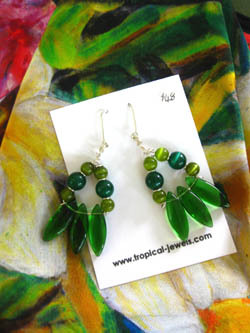 Tropical Jewels Complement Designer Scarves. 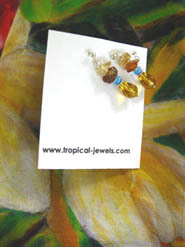 These handmade tropical jewels, mostly in the form of glass bead earrings, supported by sterling silver wire findings, are designed to complement designer silk scarves by Jill Booth. 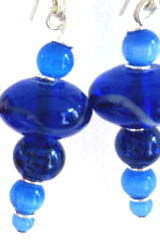 Simple glass beads, whose colours echo those in the silk scarves, are crafted into earrings and pendants. 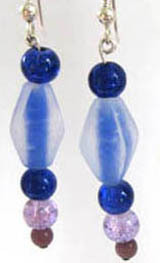 Their design is simple and comfortable to wear with any outfit, with transparent or opaque glass beads being held in place with silver wire, twisted and curved to shape. 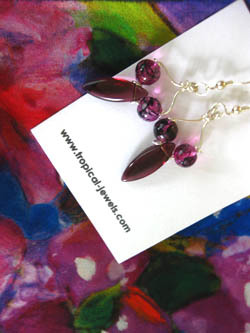 Although my idea in making these little jewels was mostly to enhance the scarves, of course they may be purchased separately. 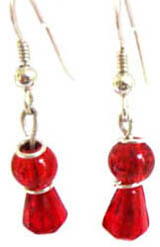 They may be ordered as a hook style or a stud. 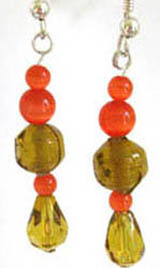 They are inexpensive to purchase - and easy to pop in with a matching scarf! 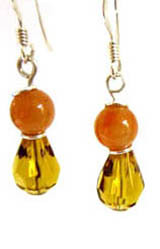 In fact, as it would be so easy to include one or more with your scarf purchases, I would be delighted to pop in a pair of earrings from the following range, or similar, absolutely free of charge, with every purchase over $150 in total. 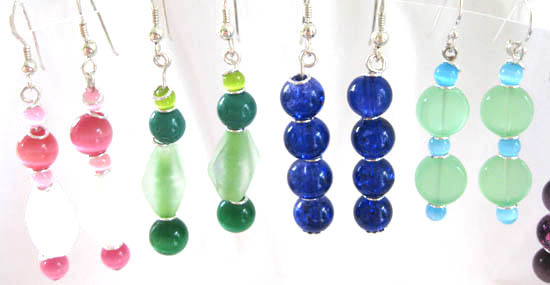 If your total scarf purchases exceed $300 please add one pair of earrings from the second or third ranges, below, or else two pairs from the range above, free of charge. 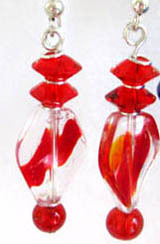 Please choose which ones you like best - or would you like me to choose for you? What, even more creativity and sharing? Should your scarf purchases, on any one occasion, exceed $600 then I think you could ask for anything you like - within reason! 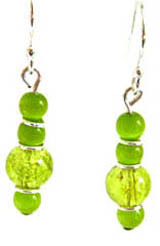 Then there are the slightly more elaborate, but still very inexpensive tropical jewels for your pleasure, such as those, below. If you have a special colour combination in mind I am happy to customise a design for you so please let me know your ideas via the form, below. 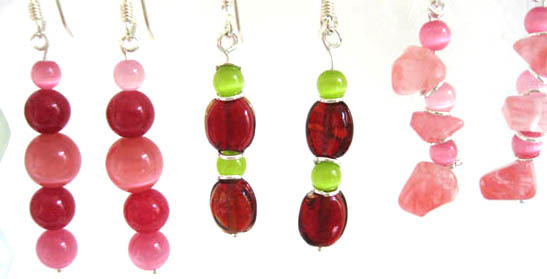 Making earrings doesn't take very long but it is always possible that I don't have particular beads in stock all the time so please also suggest an alternative. 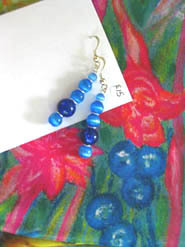 Prices noted here are intended as an introductory offer and will be revised in a few months, so if you would like to stockpile a few gifts for friends or for yourself, now's your chance! 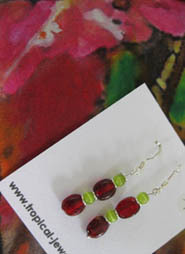 Postage is included if you also order scarves. 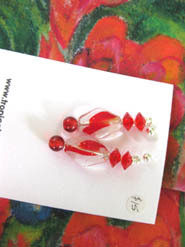 Otherwise, please add $2 per pair of earrings for orders within Australia and $4 for overseas orders. 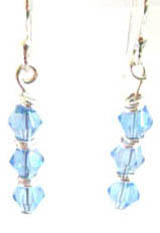 Orders of earrings may be made by quoting serial numbers shown. 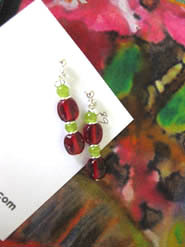 Payment by Paypal or Direct Deposit.